It was the words that I’d wanted to hear my entire life. Didn’t every girl fantasise over the perfect man going to buy the perfect ring and getting down on one knee in the most romantic way possible, before telling them that they loved them so much, they wanted to spend the rest of their life with them? Me and my best friend Cici used to talk about it all the time. We used to plan our dresses, the music, the flowers—every part of the ceremony down to the very last detail. Of course, the man didn’t really matter. We were young enough and naive enough to believe that we would magically meet the perfect man without even trying. I certainly hadn’t expected it to ever go any further than that moment, so when he came and joined me at the bar later on for a drink, despite being mobbed by other members of the audience, I felt like my entire life had been leading me up to that moment. I felt like everything that I’d experienced was all drawing me closer to Danny, the love of my life. Here was a gorgeous man who was destined to be famous, and who could have any girl in the world hanging off of his arm, talking to me, asking me questions, and actually showing me interest. As he flicked his messy auburn hair from his warm, chocolaty eyes and he gave me that smile that had already melted the hearts of the nation, I thought for a dreaded, wonderful second that he was going to kiss me in front of all of those people. But after a few beats of pure terror, he didn’t. Instead he handed me his phone number, and he asked if I would like to go on a date with him. Me—boring old Charlotte (Lottie) Jones—on a date with Danny Boreom, bassist of the (now very) famous band Jax. It didn’t seem real. Breathless and turned on by the power of his mouth, I invited him inside. Although he coolly and calmly turned me down, it was still the best night of my entire life, made even better by a phone call the next day to say that he only didn’t come inside with me because he wanted to be something real. He didn’t want our love to end at a one-night stand, he actually wanted us to develop and for him to become my boyfriend. Fast forward three and a half years and we were blissfully living together, grazing by every day happily and easily. Although he was away for a lot of the year touring, it didn’t seem to bother us. We were so strong and so solid with what we had, that nothing would get in our way. It was perfect, still a dream come true and that intense chemistry hadn’t burned down one bit. But that was normal, right? Everyone freaked out at first when they learned that they were going to become someone’s wife…didn’t they? Of course, I already knew that wasn’t true. I’d already been proposed to once in my life before, and that time, I didn’t hesitate one bit. Panic didn’t even come into the equation, I was happy, over the moon at the thought of becoming his wife. This was nothing like that had been. I felt completely different. For the first time in a very long time, I allowed myself to think about Joe again, and almost the second that I allowed that vault to open in my mind, I felt myself fall into a tailspin. As his face filled my brain once more, it was almost as if the last five years hadn’t happened at all, and that I was still his proud girlfriend, waiting to be his wife. As the wound reopened, I could barely hear what Cici was saying to me. I felt like I was gaping, exposed, and extremely vulnerable all over again, and I did what I’d always done when I was younger, when things got too difficult for me. I started to talk to Joe in my mind. It was so strange to have gone from the closest people in the world, to absolutely nothing, and I struggled to imagine that he’d changed one bit. Of course I had, my life was completely different, but I couldn’t think of Joe without viewing him as the other half of me. The boy that I’d adored, and the one that I never thought would leave my side. “I…I’ve got to go,” I finally announced to my friend. “I’ll speak to you later, okay?” And then I hung up the phone, without even waiting for her to answer. I knew that I was being rude, acting more than a little strange, but I needed some time. I needed to be alone with my thoughts to try and process all of this. So quite how I found myself sitting at my computer with my fingers running along the keys, I wasn’t quite sure. Don’t press anything, I willed myself. As soon as you do, everything will change. Since we had gone our separate ways, I hadn’t contacted Joe once, and with the uprising of social media I hadn’t looked him up either. I just couldn’t face it. He was like an imaginary fantasy in my mind now, and I wasn’t sure that I wanted to ruin that with reality. What if he was married now? Or into drugs or something? His life could have gone in any direction, and I wasn’t sure that I really wanted to find out which one. In the end I forced myself to stand up and to move away from the computer screen before it lured me in. I couldn’t do it; I just wasn’t willing to take that step into the unknown. It terrified me far too much. But as I wandered aimlessly from room to room, I realised that I couldn’t just do nothing either. I needed to calm this beast within me, which meant delving into my past whether I liked it or not. I stood at the bottom of the attic ladder, wondering what awaited me up there. When me and Danny decided to buy a place together—well, he put the most money in of course, but we still classed it as ‘ours’—I shoved everything related to my old life away, not wanting to even consider it. But it was always a comfort, knowing that it was there, knowing that I could access it at any moment if I really wanted to. existence in white America. Rather than vanishing from national sight and memory, Indians and their ghosts are shown to be ever present. This book transports the readers into dimly lit parlor rooms and darkened cabinets and lavishes them with detailed séance accounts in the words of those who witnessed them. Scrutinizing the otherworldly whisperings heard therein highlights the voices of mediums and those they sought to channel, allowing the author to dig deep into Spiritualist belief and practice. The influential presence of Indian ghosts is made clear and undeniable. gender, civilization and the development of an American national character. concepts of racial difference and socio-political hierarchy. past and thus safely nonthreatening. “Indian spirit guide,” which persists today. reveals the complex and sometimes conflicting nature of such phenomena. manliness as positively linked to violence. paranormal studies, that I look upon séance activities of nineteenth-century America. gender is the main thrust of this project. is not borne out by the increased frequency of Indian apparitions. nineteenth-century American culture and continue to do so. exception to that is the Spiritual culture of New Orleans. will be addressed in Chapter Four. bodies of scholarship most directly engaged and built upon in this book. Spiritualism and the Cultural Politics of Nineteenth-Century America (Berkeley: California University Press, 2008), 73. York: Alfred A. Knopf, 1978), 90. 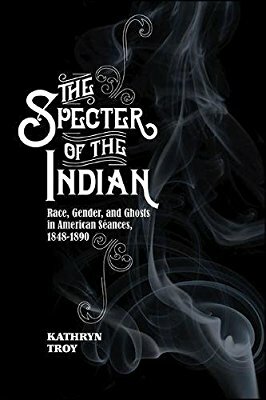 Ghosts and American Subjects (Hanover: Dartmouth, 2000), 7.
and Roaring Radicals: Spiritualism in American Literature, 1850-1900 (Urbana: University of Illinois Press, 1973). (Chicago: Illinois University Press, 1999), 11. 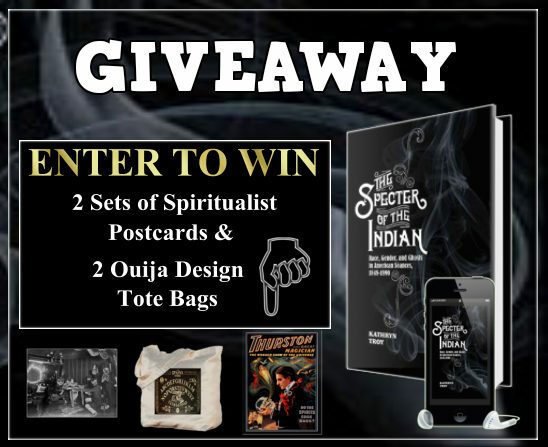 (Cambridge and London: Harvard University Press 2005), 39.
of spiritual postcards and 2 Ouija design tote bags! Kathryn Troy has two Master’s Degrees in History from Stony Brook University. 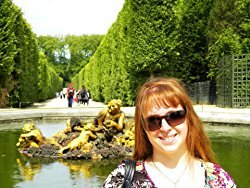 She contributed to the anthology The Spiritualist Movement published by Prager in August 2013, and teaches at Farmingdale State College and Suffolk County Community College. My alarm went off at the same time it always did. It prattled out its god awful incessant whine like it’s prone to doing as if I actually cared about its existence. I reached a hand out from under the blanket and slapped the snooze button with a little more gusto than I probably should have. Maybe it’s just me, but putting a little extra mustard on that snooze button in the morning gives me a feeling of satisfaction, like it’ll think twice about bothering me again if I just smack it hard enough. The alarm blared back into life. Who decided nine minutes was the standard amount of time for the snooze feature on an alarm clock? Was there some kind of study done at some point that found that people only needed nine minutes of extra sleep at a time? Personally I would think fifteen or twenty minutes would be more appropriate. Again, maybe it’s just me. I pushed the blanket back and lurched onto my feet. The room was spinning ever so slightly. That had to do a little with standing up too fast, and a lot to do with being hung over. I clicked the snooze button on the alarm with the big toe on my right foot. Everything in my room was on the floor. I didn’t own a traditional bed. It was just a futon mattress lying on the floor, so everything had to be at ground level so I could easily reach it. I was trying to adopt a Japanese style of living. All right, fine. I just couldn’t afford real furniture. Are you happy now that you got me to admit that? Ben Mariner is the author of Apocalypse Wow as well as The Many Lives of Zane Montgomery, which definitely sold some copies to some people. He currently lives in Denver with his wife and animals. He enjoys mozzarella sticks, dunk tanks at carnivals, and solving crime with his psychic powers and best friend/sidekick. Ben Mariner will be awarding a $25 Amazon/BN GC to a randomly drawn winner via rafflecopter during the tour, and a $25 Amazon/BN GC to a randomly drawn host. Ben, thanks for being here today. Tell us about you. I prefer Oingo to Boingo. I love puzzles both crossword and jigsaw. I was raised on Seinfeld and Friends. I strongly believe in the use of proper punctuation and not shortening words for no reason. If I could be any animal in the world, I would choose a kangaroo. I would probably say Adam Brody. He just seems like a pretty chill guy that would be super fun to just grab a drink with and debate the everyday minutiae with. Plus, Seth Cohen from The OC is one of my favorite characters of all time. That story is over a decade long and kind of hard to sum up quickly. The idea has been bouncing around my head since high school and I kept coming back to it, trying to write it down, but it never really took hold. I never really got past the first chapter until a few years ago. Once I broke that barrier, it was easy to finally bring this book to fruition. I’ve got to start every writing session off with Thunder Road by Bruce Springsteen. With Apocalypse Wow I tried to listen to as much 90’s music as possible to help me get in the 90’s frame of mind. Jack Winters is just kind of a loser. He works in a record store with his friends and lives in a crumby apartment. He has an almost unhealthy fixation on 90’s pop culture and a deep rooted love for retro video games. He’s just kind of drifting along, going with the flow and using sarcasm as a way of dealing with the everyday doldrums. Unfortunately, since Johnathan Brandis is no longer with us (RIP), I’d want to see Alex Solowitz as Jack. He was absolutely hilarious as Mickey Parke in the 2gether movie back in the early turn of the millennium and I’d like to see him in more of a leading role. Next up is Apocalypse Wow 2: Apocalypse Wower. It’s set a year after the events of the first book. Jack is missing and everyone in the world seems to be out to find him. Keep plugging away. Times will come when you think no one cares or wants to read it. We all have to go through those things. Just keep pushing your work out there and know that there will always be people who want to read it. I just finished reading The Call By Eli Freysson. It’s a fantastic YA fantasy book that just really captivated me. It was dark and gritty. Really good stuff. I highly recommend that to anyone looking for a good adventure. I don’t know if it’s a talent necessarily, but I’m a bottomless pit of useless information, especially when it comes to pop culture. I remember things most people never even noticed in the first place. That information, however, almost never comes in handy. Such a touch question. There’s so many amazing powers. I think I’d go with healing power like Wolverine’s. Mostly because I hate being sick or injured. It’s annoying. So eliminating that would be pretty sweet. I just hope everyone who decides to read Apocalypse Wow enjoys it and wants to recommend it to a friend. It’s just out there to entertain, and I hope it does that.